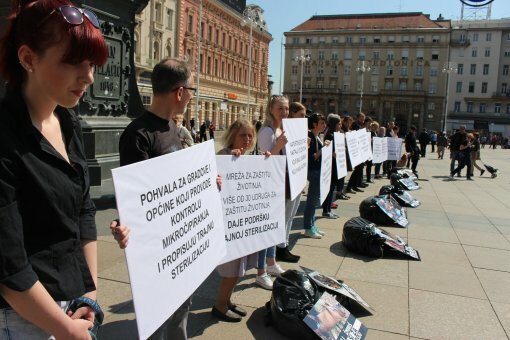 The Animal Protection Network volunteers have given an upsetting performance at Zagreb central square on Friday, April 20th, 2018 as part of “Don't turn a blind eye, castrate” campaign to draw attention to the burning problem of emergence of abandoned animals, which they painfully deal with every day. They have wrapped themselves in black bags and lied down in the center of Ban Josip Jelacic Square, symbolizing thousands of rejected puppies and kittens condemned to suffering and death. 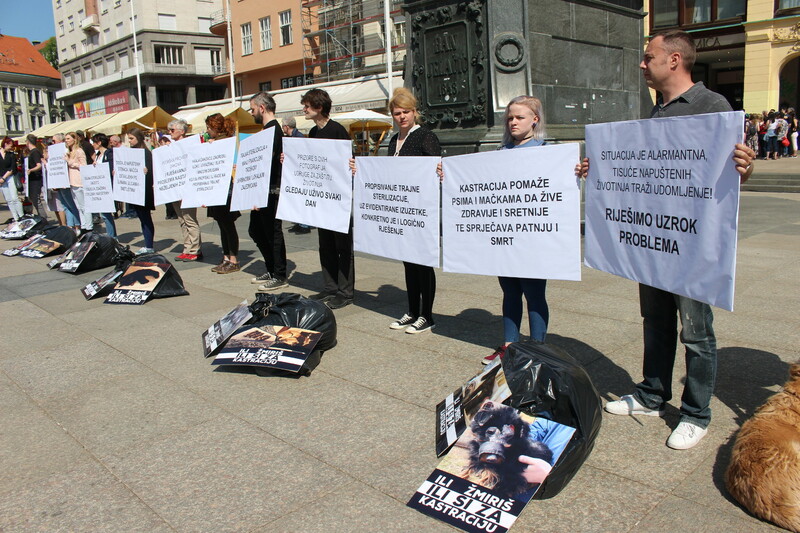 The displayed banners showed the brutal everyday life of animals whose fate is part of sad statistics and crime chronicles. All those unwanted and violently interrupted lives were created by animals with caretakers who didn’t spay/neuter them although neutering has many health and other benefits for animals. 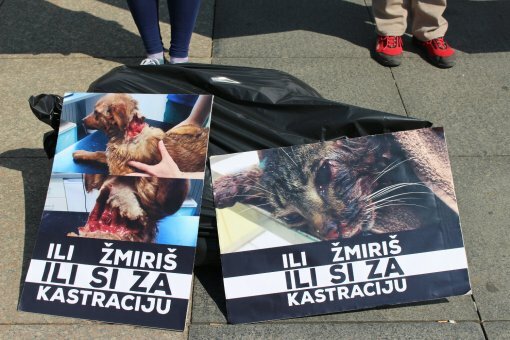 Left to themselves, the vast majority of puppies and kittens end their short lives marked by pain and suffering, with no one ever noticing them. Those more fortunate among them end up in always overcrowded shelters or in homes of overburdened volunteers. Only a smaller number will live to their old age because there are many more abandoned animals than places in shelters and those wanting to adopt them. 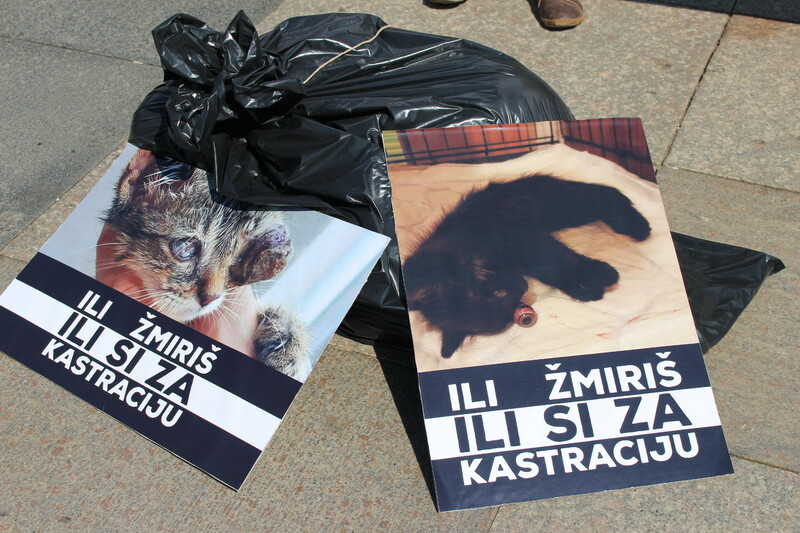 Spaying/neutering is a humane solution as opposed to trampled, drowned and abandoned animals. The Animal Protection Network, with over 30 animal protection associations, believes we must not turn a blind eye to the suffering of animals and that only by prescribing mandatory spaying/neutering we can stop the vicious circle of uncontrolled animal reproduction and irresponsibility of individuals who reject unwanted offspring. The Network commends the cities and municipalities applying the Animal Protection Act, which gives them this powerful tool to put an end to the ugly stories taking place daily in the streets, dumpsites, forests, ditches and containers. 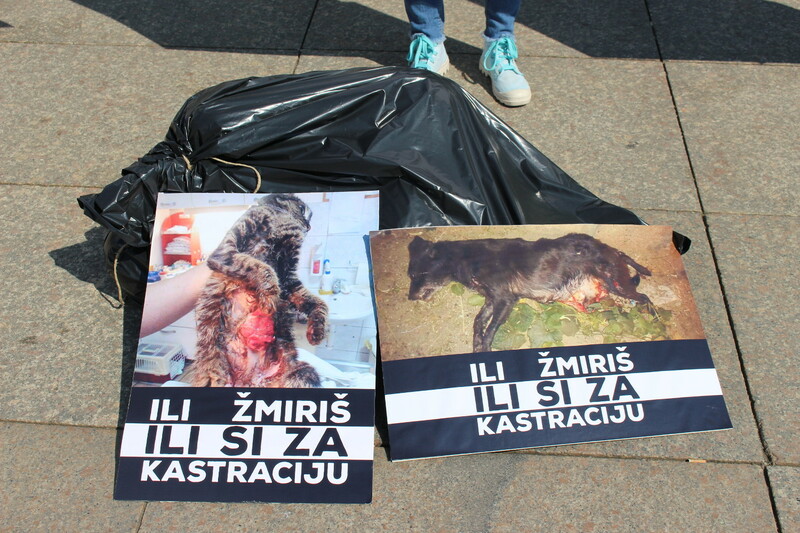 Along with the control of microchipping of all dogs, it is important for cities and municipalities to use the legal possibility of prescribing permanent sterilization (spaying/neutering) as a mandatory method of dog and cat reproduction control, minding the prescribed recorded exceptions. Such a concrete and logical solution can reduce both the suffering of animals and financial expenditures due to irresponsibility of citizens. 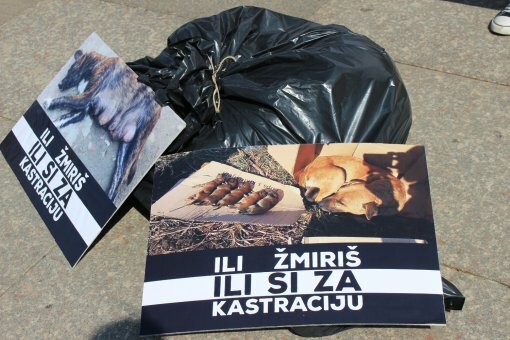 The Animal Protection Network and its members who regularly take care of abandoned dogs and cats thank Cakovec, Zagreb, Ilok, Varazdin, Slatina and many other cities and municipalities, which have prescribed or work on prescribing permanent spaying/neutering and have addressed the causes of the problem. The current alarming situation in which all shelters for abandoned and lost animals are overcrowded and in which thousands of rejected animals are waiting for adoption, requires permanent sterilization as the only humane and sustainable solution for reducing the number of abandoned animals. 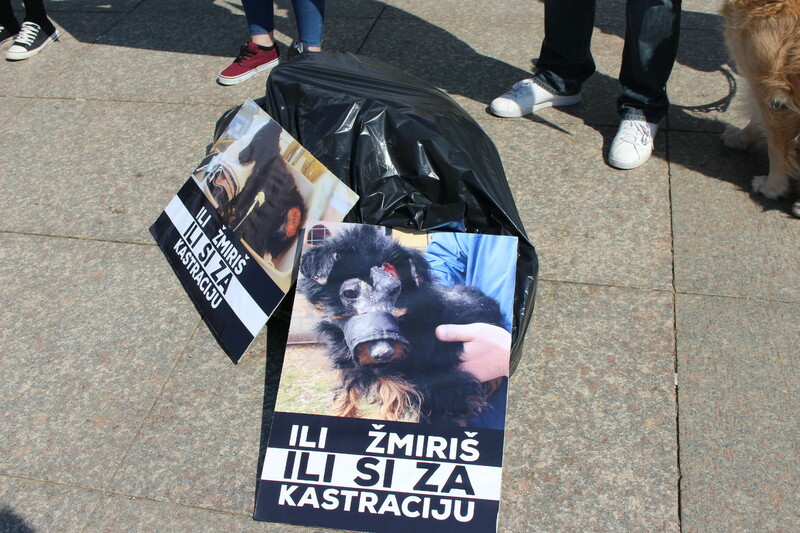 The member associations to the Animal Protection Network, having saved over 5000 animals only in 2017, appeal to everyone to stop turning a blind eye to the suffering of animals and to uphold prescribing of mandatory sterilization in their local community.